The $1.8 billion MCU said it now has 16 branches throughout the five boroughs, Westchester and Long Island. Cutting the ribbon at the grand opening are, from left, State Assemblyman William Scarborough, community leader Yvonne Reddick, MCU President/CEO Kam Wong, MCU Chairman of the Board Mark Brantley, MCU Board Secretary Shirley Jenkins, U.S. Rep. Gregory Meeks (D-N.Y.), City Councilman Leroy Comrie and district leader Elmer Blackburne. 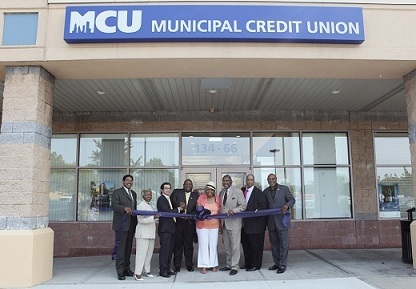 The $1.8 billion Municipal Credit Union has opened a branch in the southern part of Queens to help better serve its members in that area.